“When early humans began to move through their environment in a more controlled fashion they established paths which later turned into lanes, lanes into roads, and eventually roads into streets – city streets being bordered by architecture on both sides. Tomoko Goto is not the typical street photographer. The photographs on exhibition, taken in Japan, Malta and The Netherlands show people in a city, but rather their near-absence, fleeting illusions, projections of the human mind’s memory onto city scapes, and people's everyday objects reflected like appearances. 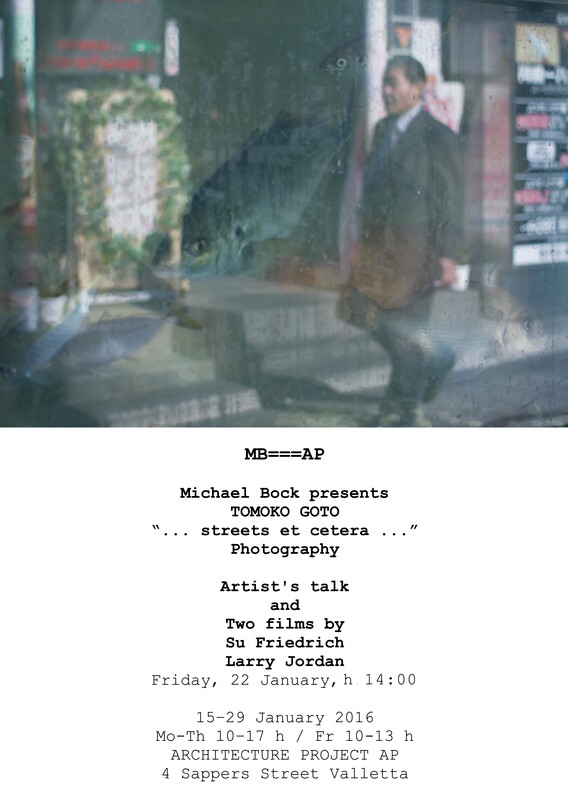 There will be a talk by the artist, complemented by a screening of two films: Su Friedrich, USA:Scar Tissue and Larry Jordan, USA:Visions of a City, Friday, 22 January, at 2:00 pm in the AP Lounge.